Operating as an extension of the municipal staff, offering a comprehensive package of services and alternative fee schedules that best meet the community's needs, Kunkel Engineering Group offers municipal inspection services that are unparalleled in the marketplace. Our inspectors are more than guys with a clipboard and a checklist. They are skilled construction professionals who know how to build roads and construct sound and lasting sanitary sewer and water mains that meet municipal applications for today and 50 years hence. They are also the last line of defense in ensuring that the project meets the community's requirements and delivers on promises made in the planning and design phase of the project. That said, we offer a comprehensive package of municipal inspection services that are delivered by the most highly skilled professional inspectors in the industry. Inspectors are available by telephone between 7 a.m. and 7 p.m. daily and will provide local office hours as needed. Post-construction inspection and follow up. 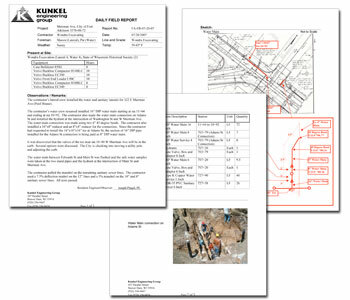 Preparation of a comprehensive inspection log that details daily operation with field reports, operations and photos; this includes notes on schematics and plan adaptations that may be required as the project evolves. Much more than a casual weekly inspection and a few notes made randomly over the course of the project, we detail and chronicle all aspects of the project, then provide a hard copy of this comprehensive document to you for archival reference as needed. This kind of attention to detail ensures adherence to strict quality standards and project specifications, and provides an accurate project record, integral for long-term infrastructure planning and maintenance. As added insurance for you, we also retain both a hard copy and an electronic copy of the project document.